Jonathan Paredes performs a somersault. EL NIDO—Mexico's Jonathan Paredes was at his magnificent best on day one of the opening stop of the 2019 Red Bull Cliff Diving World Series, ripping his first dive into the Small Lagoon to earn two 10's from the judges and a crucial lead after two rounds. The 2017 World Series champion, well-known for his often immaculate entries, is aiming for a strong start this season following the loss of his title to England's Gary Hunt last year. And the 29-year-old couldn't have asked for a better start from the tricky-looking take-off points positioned directly on the visually striking limestone cliff face. He leads the men's standings heading into Saturday's final rounds ahead of Poland's Kris Kolanus and Italian wildcard Alessandro De Rose. De Rose himself dismissed the idea that the tiny rocky launchpads were a hindrance to the divers on day one: "The hardest part is the climb up the cliff face. Once I've planted my feet and positioned myself on the take-off spot, I'm comfortable and ready to dive as normal." In the women's competition, Yana Nestsiarava of Belarus is the surprise leader after displaying unerring consistency to post two identical high scores with her first two dives direct from the rock face. Nestsiarava, who finished last season in fifth place, had a flying start in the scorching Philippines sunshine. Her first two dives into the emerald lagoon waters earned her a trio of 8.5's from the judges, and the Belarusian holds top spot at the midway point ahead of the impressive American wildcard Ginger Huber and three-time champion Rhiannan Iffland of Australia. "This is a location which is a bit difficult for me because I'm from Belarus and there it's cold," said Nestsiarava. "The sun almost killed me. Actually the view and everything around is awesome. I'm happy with my dives. I was a little bit surprised because the platform is not comfortable, so I'm happy with this, but it's only halfway and we'll see tomorrow." Meanwhile, local favorite, Filipino Australian, Xantheia Pennisi, managed to improve her round 2 standings with strong dives. Pennisi’s Forward 2 Somersaults 1/2 Twist earned her an average 7.5 score across the judges to move her into eighth place. 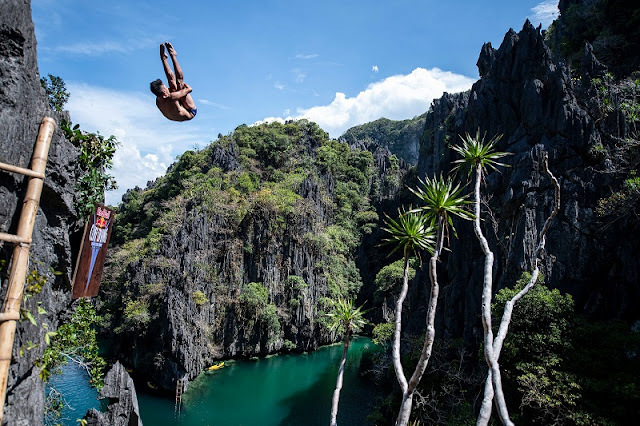 On Saturday, the action will move over to the Big Lagoon, where the divers will be able to execute their more difficult dives from the comfort of two solid platforms constructed on the cliffs.